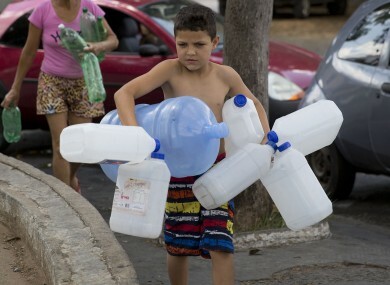 A boy carrys water containers in Brazil. BRAZIL IS THE Brazil fifth largest country in the world, measured by area or population, and it’s home to one-eighth of the fresh water on the planet, including the Amazon, the mightiest river in the world. But Brazil’s most populous region is facing the worst drought it has encountered in a century. The New York Times reports São Paulo, the largest and richest city in the country, is running out of water. Some residents say their water is already cut off for more than half of every day, and the drastic situation is getting worse, igniting protests in the city and surrounding region. Fears about what life will be like as water becomes more scarce have kicked off protests in and around the city. In a meeting where someone secretly recorded audio that was leaked to the press, Paulo Massato, the metropolitan director of the São Paulo state-run water utility, said that people might have to flee the city. There’s not enough water, there won’t be water to bathe, to clean. Well, massive growth over the 20th century built up a metropolitan area of more than 20 million residents that a leaky water system can’t adequately serve. There are serious water shortages in the three most populous states in Brazil — São Paulo, Rio de Janeiro, and Minas Gerais. But São Paulo, both the metropolitan area and the surrounding municipalities, has it the worst so far. The water supply in the Cantareira system, which provides most of the water for greater Sao Paulo, is at the lowest point it has ever been recorded — below 7% of its capacity. The drought, combined with the ever-increasing demand for water in a growing city, has been made worse by environmental destruction, climate shifts, and pollution. Forests and wetlands near the city have been destroyed as it has grown to be one of the largest cities in the world, removing an important source of water. Deforestation in the Amazon has contributed to the problem too, by removing an important source of humidity in the air. This has drastically reduced rainfall in Brazil’s southeast, including the three most populous states in the country. Residents in some areas of São Paulo say they already don’t have water for more than half the day. Not much has been done to fix broken water systems. Experts say that the best course of action would have been to fix leaky old pipes months or years ago — more than 30% of all the city’s water is lost in leaks or stolen away. The Tietê and Pinheiros rivers that cross the city are so polluted that the smell alone can make passers-by sick — but they and the sewage pipes that feed into them are still the only water that some have access to, as shown here in this photo from April of 2014. Water rationing began in surrounding cities months ago, but as problems grow worse that rationing is expected to become even more extreme, fueling anger among residents. Restaurants, businesses, and families have begun drilling their own wells and hoarding the water they do have in order to stay operational. State officials have already tapped into two of the three emergency water reserves — they estimate that there is less than two months worth of guaranteed water left. Officials recently said that they may cut water service in Sao Paulo itself to just two days a week. Officials now say they plan to build new reservoirs, to route water from other parts of the country, and to try and fix parts of broken old systems, but some of those projects could take years to complete. Meanwhile trucks are delivering drinkable water to some areas, but it would be impossible to serve the whole city that way. Email “Protesters take to the streets of Brazil over their dwindling water supply ”. Feedback on “Protesters take to the streets of Brazil over their dwindling water supply ”.